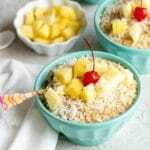 Enjoy a tropical start to the day with this easy Instant Pot Pina Colada Steel Cut Oats recipe. Flavors of coconut, pineapple and rum (extract) recreate a favorite cocktail in the form of breakfast! Add the pineapple juice, coconut milk, extracts and salt to the Instant Pot insert; stir. Pour in the steel cut oats; stir. Lock the lid in place, ensuring the vent is sealed. Select the Porridge setting, High Pressure and 12 minutes. When the cooking is completely allow 10 minutes of natural release. Follow with a manual relase of the remaining pressue. Remove the lid and stir the oats (there will be a layer of liquid on the top; see photo above) and allow to sit on the Warm seting for 1-2 minutes to thicken before serving.